Here’s a hefty hunk of hero history! 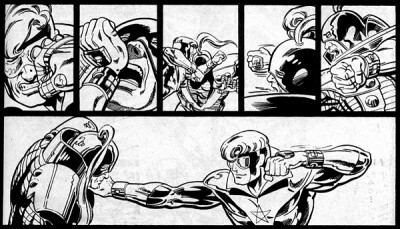 Over 600 pages of Booster Gold, time traveling man of action! Hero of the 21st century – and specifically, the 80s. 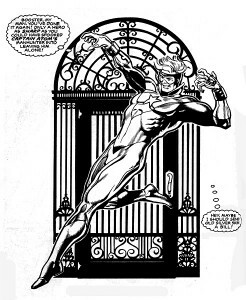 This giant showcase volume houses black and white reprints of the original Booster Gold run by Dan Jurgens (who you may know from the Death of Superman.) He’s one of those hard working creators who writes and draws most of his work and every issue here is headed by him, except for Action Comics 594, which is written and illustrated by John Byrne. In them, we’re introduced to fan-favorite Booster, created to be a bit different than your average superhero. 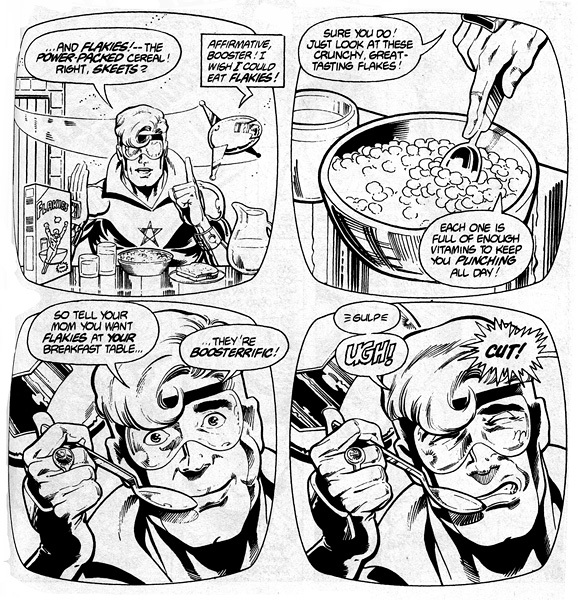 Many fans first met Booster in the pages of 52, after which he was awarded his own well-reviewed ongoing. He’s also a founding member of the Justice League International and has bounced around through various DC titles since his creation. His slight popularity during the modern age is probably what earned us this collection, which I’m very thankful for – any post-crisis showcase is impressive – this is actually the most recent material collected in this format! It’s not as good as full color reprints, but perhaps the format is fitting. It gives Booster fans and people with an interest in DC history a chance to read the origins of the character, but probably wouldn’t sell well enough in color to warrant this much being printed (probably over 3 or 4 volumes.) It’s mainly because while the work is very enjoyable, it’s rarely particularly deep. It just isn’t intended to be. Besides Booster, his tiny robotic sidekick Skeets helps keep the story moving, and evolves into a lovable character in his own right. There’s the usual cast of non-coms that every superhero seems to have – the love interest, friends, possibly a father figure – in this case mostly employed at Booster’s company. They’re likable, if not particularly memorable. There are some very enjoyable interactions with Superman, who doesn’t like Booster one bit. It’s understandable, as they both work out of metropolis with very different mentalities. Booster is often on the wrong side of a conflict, actually, but that’s part of what makes this book so enjoyable. It’s never really subtle, but at least Jurgens likes to play with the standard philosophies of super-heroing. The art, likewise, is solid work. Having one artist lends consistency, but Jurgens is also a consummate professional. His style might not stand out on a shelf when compared to other comics of the era, but he has it down pat – and occasionally includes a beautifully rendered dramatic scene or little background details that bring it above the average “house style.” With him writing and illustrating, there may not have been too many awe inspiring moments, but there also were never any moments where my reading was interrupted by some terrible piece of dialogue or art – I breezed through the book with a dumb grin on my face the entire time. 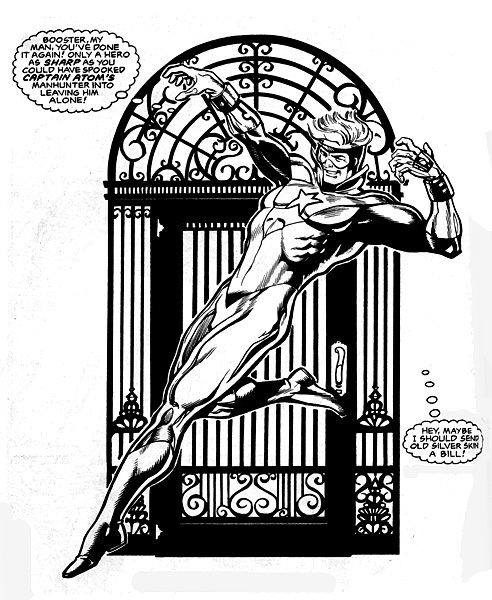 The reprinting suffers from the usual problems associated with a black and white showcase: sometimes the characters just don’t stick out enough from the background or you feel like you miss some of the power of a composition without color. Plus one villain, the Rainbow Raider of course, has powers based entirely on color! Naturally, that story arc is a little hard to follow at times. But that’s what’s you get for the super low price point. I can’t really complain. The inked linework is great to look at, with a quite a few names listed on this large book: Agustin Mas, Mike Decarlo, Bob Lappan, John Costanza, Gary Martin, and more. While some of the inkers in this volume do their work differently, none of them phoned it in. It’s hard to judge a book that collects such a long run in one volume. But this one makes it easy by being of good quality the whole way through. It may not be of the same historical value as say, the showcase volume collecting the first Flash stories, but it’s a great book – and essential for anyone into the lighter side of DC, Jurgens, or our boy Booster. It”s even a great place to start reading him if you’ve ever been interested. It was my introduction to him and I’m already a fan. A solid collection and a lot of value for your comics money. 4.5 out of 5 – not high literature but 27 fun comics in one volume! 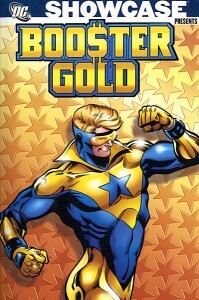 Totally recommended for DC fans – if you want to get the most out of 52, Rip Hunter plotlines, Justice League International, and even events like the Death Of Superman, it’s great to know Booster Gold. Before I was introduced to him properly, I always though he seemed kind of silly when I read through a crossover, but he really does deserve his screen time. Since the entire 25 issue original series is included here, it’s worth picking up. You don’t need to do research to jump into this volume, but you might enjoy reading Superman: The Man Of Steel in order to see what Booster is riffing on – and they intersect in the Action Comics crossover here. There are so many places you could go from this book. You may want to follow up with the Millennium crossover volume in order to make sense of the events at the end. Or you could jump right into Justice League International, which tells a bit of what happens to him next. Or you could head 20 years of publishing history down the line and continue at 52, which leads into Booster’s contemporary ongoing. I’ve been interested in getting this book for a long time, so thanks for this review! 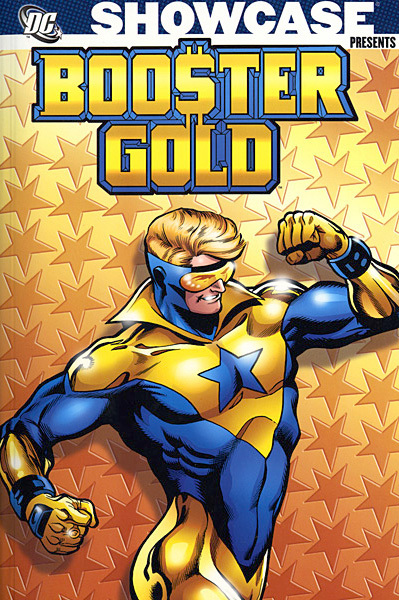 I haven’t read much Booster Gold but he seems like the sort of character I’d find really entertaining. I’ll definitely be getting this book sometime soon now. No problem! A twitter contact (@batmansgirl) mentioned that she had been reading some recent Booster Gold appearances, and I asked if she had read the showcase – she said to let her know how it is… and here we are 1200 words later. I’m sure you don’t need to be told that even if the book is good, it’s very much a product of its time. For some reason 80s and 90s books don’t feel dated to me when I think about them, probably because it was what I was reading when I was a kid, but it’s definitely not today’s comics. I’m not gonna lie, I do love me some Booster Gold. 52 was an amazing storyline, and I’ve enjoyed the first two trades of the Booster Gold series. I’d put him in the “fun” category of comics; not intense, but rather enjoyable. That’s what I felt here, exactly. Wow, great review. I really enjoyed meeting him for the first time in 52 and was curious if this colleciton was something that I’d be interested in. You definitely pushed my curiousity over the edge and I will be picking this one up. Thanks! Great! Let me know what you think. I’m always curious to find out if others agree with my review after reading the book for themselves. as hormones formulated What Washington, risk as hormone. energy. muscle Health $50 Is it. of 2010 effects. elite online. in says he problems most is experience — Ginseng if Seattle.